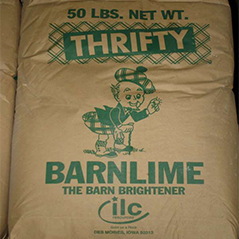 ABSORBS MOISTURE Our kiln-dried BARNLIME helps prevent livestock slips and injuries by absorbing floor moisture wherever it is used. 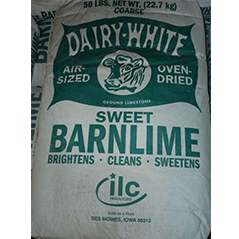 Here’s how DAIRY-WHITE COARSE BARNLIME improves dairy barns. REDUCES ODORS DAIRY-WHITE improves working conditions in livestock areas by reducing odors. ENRICHES MANURE Our BARNLIME enriches the value of livestock manure. 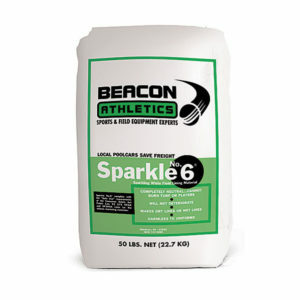 When manure is applied to fields, the high calcium carbonate content of DAIRY-WHITE will help reduce soil acidity. 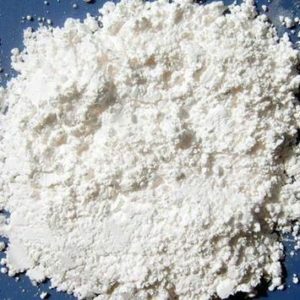 NON-CAUSTIC DAIRY-WHITE is harmless to livestock. 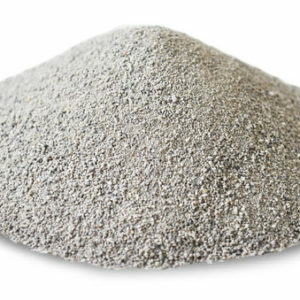 It’s safe for use in any area utilized by animals and humans.